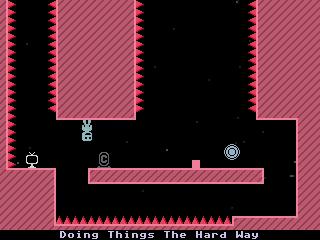 VVVVVV is at once utterly charming and controller-snappingly difficult. Retro graphics, exquisitely responsive controls, a single gameplay mechanic and a pitch-perfect chiptune soundtrack come together to form one of my favourite games of all time. Certainly, my 3DS has been used for little else. Let’s talk completion and speed.